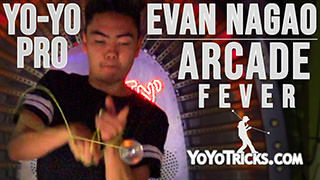 Learn Evan Nagao’s epic fingerspin trick, Gotta Catch ’em All. 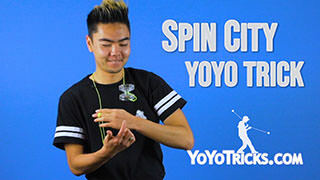 To start this trick off, you are going to do the same throw as YoTricks’ finger spins tutorial. And that is a horizontal throw from your opposite shoulder, outwards. Then you are going to do a Pinwheel, just one time. 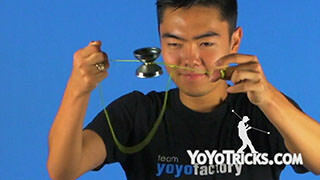 Then you are going to throw the yoyo up, slack around your neck, and land it in a fingerspin. 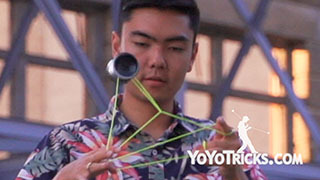 You will notice that the string is coming from my yoyo finger over my opposite shoulder, around my neck, and the string is going over both of my arms. My opposite arm is under my throw arm. This element may seem intimidating at first, but I am going to teach you a few intermediary steps that will help you ease your way through it. 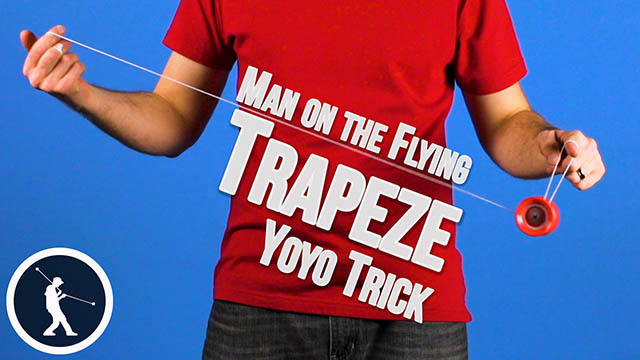 The first step is to throw a trapeze. You are going to pinch. Then swing your throw arm close to your body, under your opposite arm, and over your neck. Now the incorrect way to do it would be to do it like this, where the string is coming from your throw arm over your throw shoulder. You want to make sure the string is coming over your opposite shoulder and that your arms end up crossed. 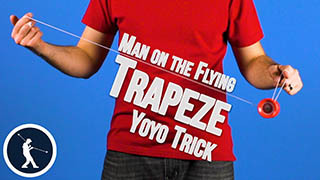 Once you have got that down, the second intermediary step is to just do the same whip with the yoyo sleeping. You are going to pull the yoyo up, swing your arm around again and create the slack. Throw it over your neck. As you can see, the yoyo is in this same position is would be if you were to do the actual finger spin element. 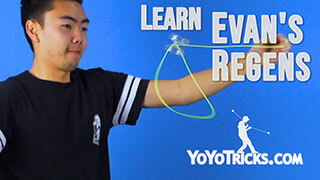 Finally, you are going to do the actual element which is to throw the horizontal throw and then whip the string over your neck and land it on the finger spin with your opposite arm under your throw arm. 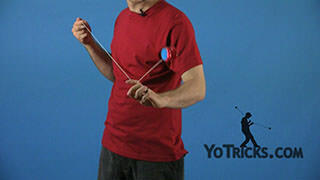 Once you have landed the finger spin, you are then going to take this string off of your neck, swinging the slack down. Then put it onto your wrist. 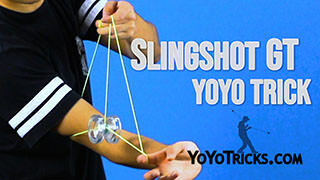 To do this, immediately after you have taken the slack off your neck, you are then going to swing the slack down and you are going to take your thumb on your throwhand, place it under the string connected to the yoyo, and slip it onto your wrist. 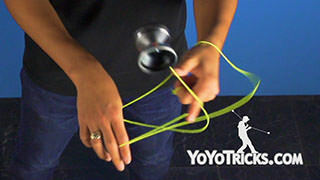 From here, you are going to pop the yoyo up and land it on a finger spin on your throwhand. 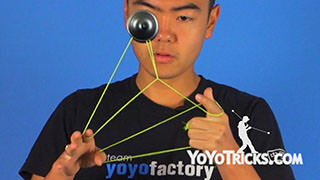 While you are doing that, you are going to hook the string connected to the yoyo with your middle finger of your opposite hand. Then you are going to take your thumb and remove it from the string coming from your wrist. At the same time, you are going to put your index finger in the place of your middle finger where it was hooking. Then you are going to take your middle finger and place it on top of the strings coming from your index finger. Then you are going to let go of the string coming from your thumb on your throwhand. This will create a slack. 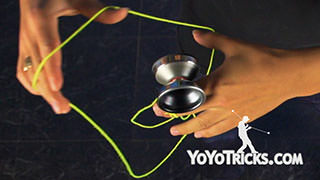 You are then going to throw the slack over the yoyo, onto your finger. Make sure to pull tight enough so that there is no slack. 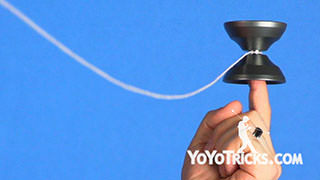 At the same time, do not pull too tight, otherwise the yoyo might fall off your finger. You are going to slowly raise your hand, keeping your middle finger above your thumb of your opposite hand. 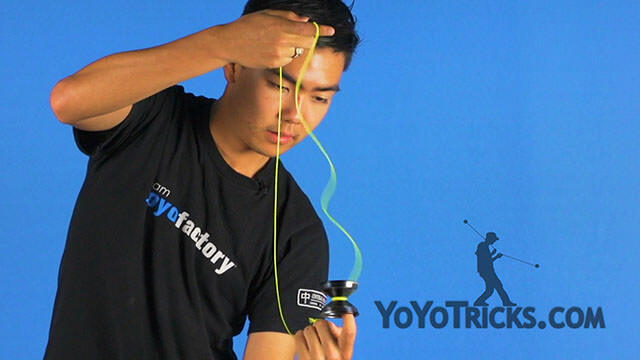 This will allow the string to go into the gap of the yoyo. Then you are going to pull on your thumb and release your middle finger of your opposite hand. 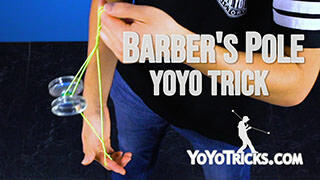 This will cause the yoyo to start to bind. 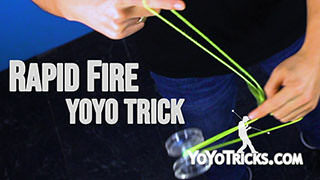 You are going to then raise your opposite hand and let the yoyo tornado bind. Make sure you keep the strings apart, otherwise the tornado might catch on the other string, and it will not work. Then you are going to pop the yoyo up. As you are doing this, you hands are going to switch positions. 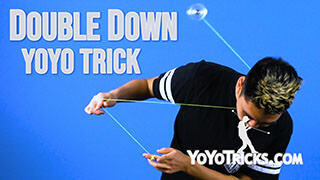 Your throwhand is going to be on top, while you land the yoyo on your opposite hand to do another tornado bind. 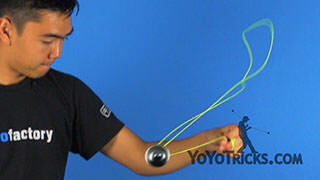 Then you are going to bring your arms together and catch the yoyo. 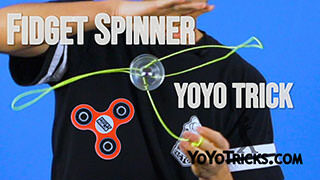 Also if you hit all the elements in rapid succession, it should make the trick go by faster so that the yoyo has enough spin time so you can end the trick. And that is Gotta Catch ‘Em All.